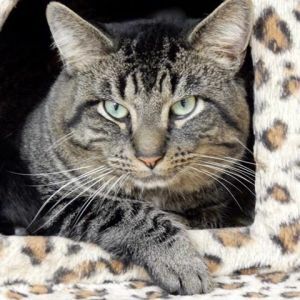 Hi, my name is XAVIER and I am a 4 and a half year old BIG brown tabby male with GORGEOUS green eyes and SUPER SOFT thick fur. It’s been said that I am quite the ladies man as I GET ALONG nicely with female cats as well as other male cats. Plus, I get along GREAT with DOGS. I'm shy in new surroundings, but with a patient person who will give me time to get used to a new home, it will be worth the wait. Ready for your lifetime pal? Arrange a meet and greet! I am in residence in Manhattan, NY. I am neutered, UTD on shots, and FIV/FeLV negative.